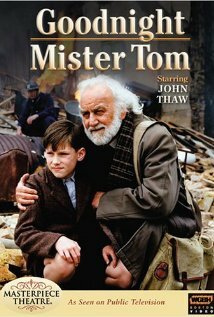 Buy or Rent Goodnight, Mister Tom (1998) Movie DVD & BluRay Online! Movie Plot: We’re in an English village shortly before Dunkirk. “Mr. Tom” Oakley still broods over the death of his wife and small son while he was away in the navy during WWI, and grief has made him a surly hermit. Now children evacuated from London are overwhelming volunteers to house them. Practically under protest, Mr. Tom takes in a painfully quiet 10-year-old, who gradually reveals big problems. William nightly wets the bed. He can’t read or write, although he is intelligent and shows artistic talent. He constantly dreads going to hell. Scars cover his back. Mr. Tom soon realizes that his little boarder comes from a horribly abusive home, and determines to provide him a better one. All goes well until William’s mother persuades him to return to London for a few days’ visit. When Mr. Tom hears nothing from the boy after two weeks, he can endure the loneliness and worry no longer.